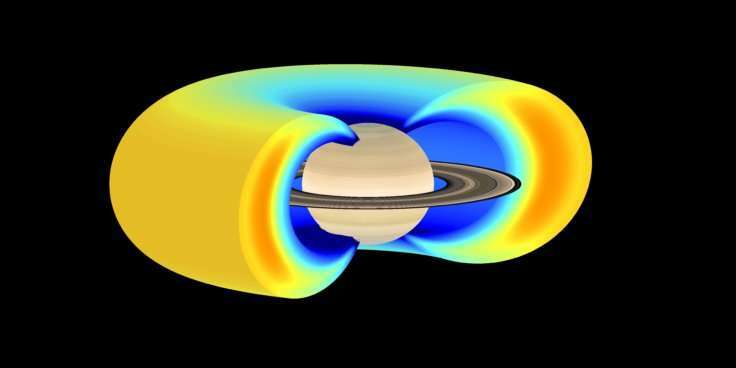 According to lead author, Dr. Emma Woodfield from British Antarctic Survey: "This research is really exciting because the high energy electrons in the radiation belt around Saturn have always been assumed to come from radial diffusion. We've identified a different way to create a radiation belt that no one knew of before. This study provides us with a better understanding of how radiation belts work across the Solar system and will help modellers forecast space weather more accurately at the Earth, which in turn will protect both astronauts and satellites from radiation hazards." "Saturn gave us the opportunity of abundant Z-mode waves, to really test what these waves can do to the electrons on a large scale. Some people think that planets are just cold chunks of rock travelling through empty space, but the way each planet interacts with the particles in space is complex, unique and exquisite, and studying them can tell us about our own planet and the rare extreme events that occasionally do occur." Prof Yuri Shprits from GFZ German Research Centre for Geosciences says: "I think it's most critical to understand the extreme radiation environments of the outer planets. These studies provide us with a unique opportunity to evaluate the potential extremes of terrestrial space weather and to understand what space weather conditions may be around planets beyond our Solar system (exoplanets)". Solar system radiation belts – Jupiter, Saturn, Uranus and Neptune all have strong magnetic fields and radiation belts. It is thought Mercury may have transient radiation belts. Radial diffusion – lots of little nudges which push electrons towards or away from the planet, motion towards the planet results in an increase in electron energy. Chorus – Whistler mode chorus waves – a type of plasma wave in a magnetised plasma, these radio waves are converted to sound they sound like the dawn chorus. Z-mode waves – a type of plasma wave present in a magnetised plasma, so-called because of the shape seen in observations of this wave from instruments on the ground at Earth – a "Z" shape. What, no jd stomping up and down that z-pinch in plasma forming currents cannot happen in space and vacuum and that this is just hucksterism. Just shows there are more viable processes than jd's mind will allow for. Lol. The idiot is confusing a z-wave with a z-pinch! Typical EU ignoramus. Errr, there is absolutely tonnes of plasma research. Just look in any decent astrophysics journal. Or ask a plasma physicist, if you know of any. Nope, merely proves my assertion that you don't know your arse from your elbow when it comes to astrophysics, plasma physics or any other sort of physics, for that matter.